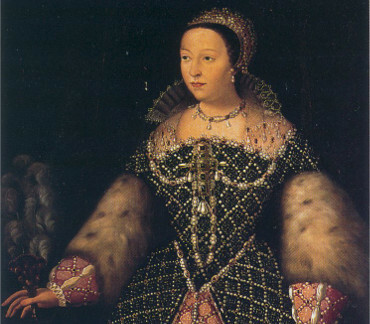 Catherine de' Medici was the wife of King Henry II. Henry's death thrust Catherine into the political arena as mother of the frail fifteen-year-old King Francis II. When he died in 1560, she became regent on behalf of her ten-year-old son King Charles IX and was granted sweeping powers. After Charles died in 1574, Catherine played a key role in the reign of her third son, Henry III. She was blamed for the excessive persecutions carried out under her sons' rule, in particular for the St. Bartholomew's Day massacre of 1572, in which thousands of Huguenots were killed in Paris and throughout France. Queen of France, wife of King Henry II of France (1519-1589). Autograph letter signed. No place. Folio (320 x 235 mm). 1 p., with address panel to verso. To secretary of state Nicolas de Neufville, seigneur de Villeroy. 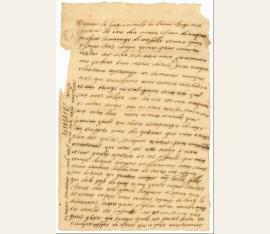 Catherine de' Médici was one of the great female letter writers of the Renaissance, drafting many of her political letters (as here) in her own hand. She had been Queen consort of France as wife of Henry II, but rose to political power after his death in 1559. She stood behind the brief reign of her eldest son Francis II and, upon his death only a year later, was appointed regent to her second son Charles IX (then only ten years old). He died in 1574, leaving Catherine to preside over the chaotic reign of her third son Henry III, a period of terrible civil and religious war in France. Despite the turmoil, Catherine was a remarkable administrator in a political landscape in which she could trust almost no one. 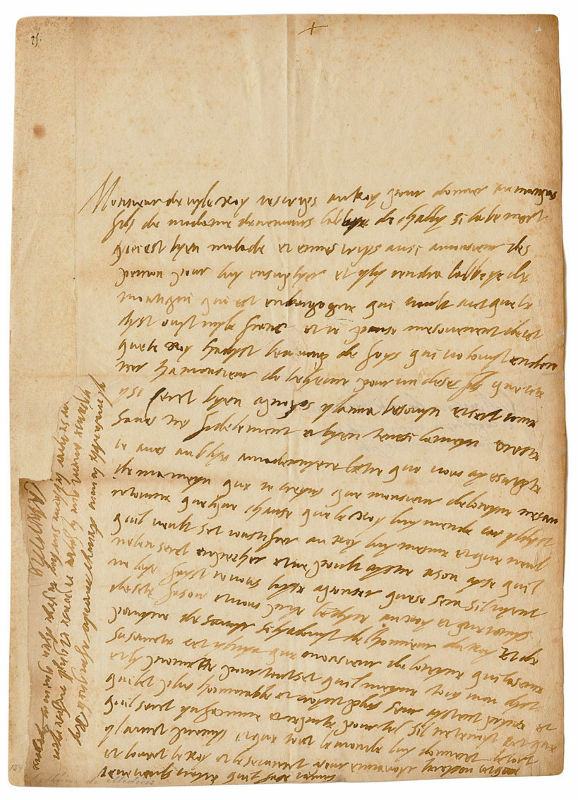 The present letter, drafted in her own hand (in itself remarkable), is typical of her direct style. She informs the secretary of state, Villeroy, one of the few members of government with whom she was intimate, of her wish to grant the benefice of the Abbey of Chailly (on the edge of the Forest of Fontainebleau) to the marquis de Saint-Sorlin, son of the Duchess de Nemours (and later duc de Nemours and Henry I of Savoy). She also makes provision for the benefice of Martigny-le-Comte (Burgundy) and arranges benefices for the sons of the statesman Pomponne de Bellièvre (who later became chancellor of France). The letter is apparently unpublished. It does not appear in the collected "Lettres de Catherine de Médicis" (1880-1943, 10 vols. 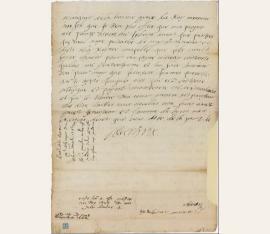 ), though a letter of 13 November 1581 (vol. VII, p. 415) addressed to the duc d’Épernon, on the same subject, allows us to date ours with some confidence. - Old folds, light browning, loss to blank left-hand margin, just touching a word of text and possibly the date, but avoiding the signature, neatly repaired, three further neat repairs to verso. 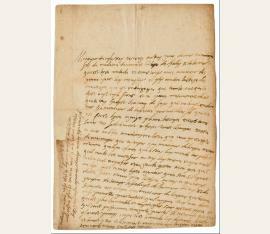 Provenance: Otto August Schulz, Leipzig..
Fine, long letter to Sébastien de L'Aubespine (1518-1582), bishop of Limoges, her ambassador to the Spanish court (though actually written for the benefit of her son-in-law, King Philip II, and his wife, her daughter Elisabeth de Valois), defending herself against the accusation of having converted to Protestantism. She asserts that she will stay what she has been the first 43 years of her life - a Catholic, not a liar or hypocrite: "Monsieur de Limoge je byen voleu que tous ses signeurs aycripse au Roy despagne de la fason que je souis pour respet de la religion non pour temoignage se que je veulle ni devant dieu ni les hommes de ma fouys ni bonnes heuvres mes pour reguart de manterie que lons ha distes de moy et le calonnie que lon ma donnees. car set lons ha mande auparavent aultre chause que set que lon fayst asteure lons ha manti car je nay change ni en nefayst ni en volante ni en fason de vivre ma religion qui lya quarante et troys hans anuit que je tiens et hye aysté batisee et nourie et je ne se si tout le monde en peult dire aultent et set je an suis marrye ne san fault aybayr car set mansonge deure trop lontemps pour ne san facher a la fin et prinsipalement quant lon se sent la consiense neste y fayst byen mal que seus qui ne lon pas tent en parler et hardiment. monstre sete letre au duc dalbe et au Roy monsieur mon fils car ie ne voldres qui pansaset que jeuse mandie heun temoynage pour nestre alaye toutte ma vye le droyt chemin mes je lay fayst pour ne povoyr plus endeurer que lon me preste de cherite et que sela ferme la bouche a seus que disi ennavent san voldrest encore ayder et metre tousiour pouine de me aylongner de la bonne grase du Roy monsieur mon fils que je tien plus chere que ma propre vie. pourse aseure me sybien avent que partyes que neul naye puisanse de my demineuer et diste alla Royne ma fille que sele veult fayre chause pour me fayre vivray contente quellay mi y entertyene et lui fase tousiour bon pour moy que je ne sere jeames que set que je ayste jeuques ysi qui est cretiene catolyque et poynt manterese ni desimeuleuse et qui le truvere tous iour ynsin [...]." The notion that Catherine had supposedly rejected Catholicism may be due to the two edicts she issued for her under-age son Henry III in July 1561 and January 1562, probably under the influence of the moderate chancellor Michel de l'Hopital. The former repealed the death sentence for heresy; the latter - the Edict of Saint-Germain - granted Huguenots private worship outside of towns. Meanwhile, Francis, Duke of Guise, butchered some 80 Huguenot worshippers in the Massacre of Vassy, prompting the first of the French Wars of Religion. The politically talented and ruthless Catherine first attempted to maneuver a middle course between Protestants and Catholics in order to strengthen royal dominion. Only after the so-called "Surprise de Meaux" (1567), during which Louis de Bourbon tried to arrest Charles IX and the royal family, did she entirely abandon compromise for repression. Her pragmatic approach is underlined by the fact that the offered the Huguenot Henri de Navarre her daughter's hand in marriage. While today some historians argue that the order for the 1572 St. Bartholomew's Day massacre did not come from her, there is no reason to believe she was not party to the decision when on 23 August Charles IX ordered, "Then kill them all!" - Note of receipt by L'Aubespine at the bottom: "Lettre de de la Royne a Mr de lymoges du 16 davril 1562. Je la monstra au Roy et au duc dalve [...]". - Left edge remargined (slight clipping; no loss to text); traces of mounting. From the Geneva collection of J. P. Barbier-Mueller. To Monsieur de Fourquevalux, explaining that the king is travelling and therefore unable to answer his letter. - Edges chipped and cut where opened, folds, browned.